McKinney, Texas – When Tammy Elliott of McKinney visits her hometown of West, Texas, she is saddened that so much work remains to help the community recover from the devastating fertilizer plant explosion that killed 15 people and destroyed hundreds of homes nearly one year ago. “West has definitely made great efforts in the ongoing recovery, but it’s hard to see the damage and know there are still West residents who are missing loved ones and aren’t back in their homes,” Elliott says. That’s why Elliott, a Zumba® dance fitness instructor, organized a Zumba® dance fundraiser April 12 in McKinney that will benefit The First Baptist Church of West Disaster Relief Fund. The public is welcome. 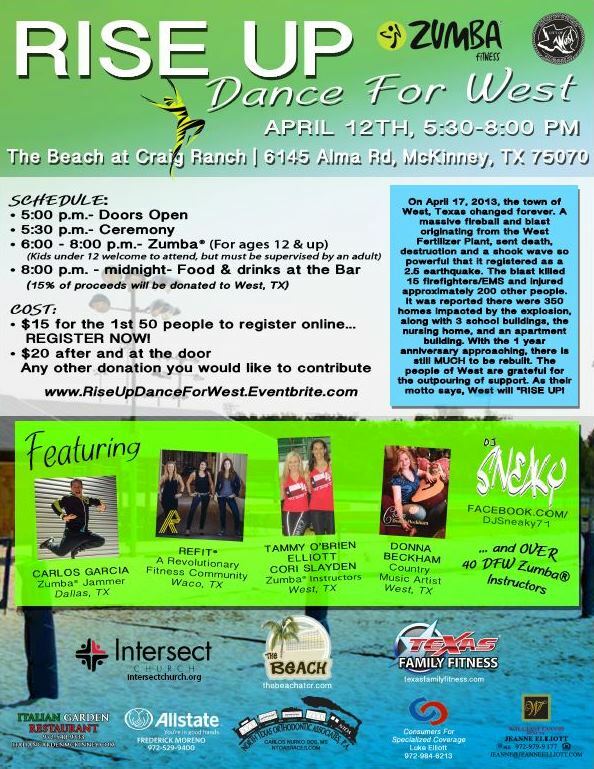 “RISE UP, Dance for West” begins at 5:30 p.m. this Saturday at The Beach at Craig Ranch in McKinney. All event proceeds and T-shirt sales as well as 15 percent of food and drink sales until midnight will benefit the West disaster fund. When a fire initially broke out at the West Fertilizer Company, emergency personnel rushed to the scene. A dozen first responders were among the 15 people killed and 300 people injured during the ensuring explosion of ammonium nitrate stored at the plant. About 350 homes and three schools were devastated as well. The opening ceremonies at “RISE UP, Dance for West” will include a tribute to fallen West first responders and a performance of the national anthem by country singer Donna Beckham, a West native. Beckham will also sing a song she wrote about West, titled “Home.” The song is available for download on iTunes, and CDs of her album, titled “Charm,” will be on sale during the event. A percentage of album sales and downloads of the song “Home” have gone and will continue to go to West, Beckham says. The public is invited to join the two-hour event, during which more than 40 Zumba® instructors – including some who are visiting from West and the Waco area – will lead a dance workout that will feature Latin, hip hop and pop songs, spun live by DJ Sneaky of Frisco. Elliott says she could not have organized the event without a great team, including Sylvia Bernal, Danny Rojas, Kerry Oldham, Connie Elledge, Liza Engh, Alicia Trimble, Sweta Rajesh, and Sara Torres. Elliott gives special thanks to Brenda Lang, who is donating her professional photography services during the event, and Greg Richey, who designed the “RISE UP, Dance for West” T-shirts, which will be sold for $15 each to benefit West. Key sponsors of the event include The Beach at Craig Ranch; Texas Family Fitness; Luke Elliott, President of Consumers for Specialized Coverage; Intersect Church of McKinney; Italian Garden on North Custer Road in McKinney; North Texas Orthodontic Associates of McKinney, featuring Drs. Donald J. Copenhaver, Robert J. Lugo, Carlos Nurko, and Jerome S. Schechter; Frederick Moreno’s Allstate Insurance Agency in McKinney; and Realtor Jeanne Elliott of Williams Davis Realty. “RISE UP, Dance for West” poster by Alicia Trimble.